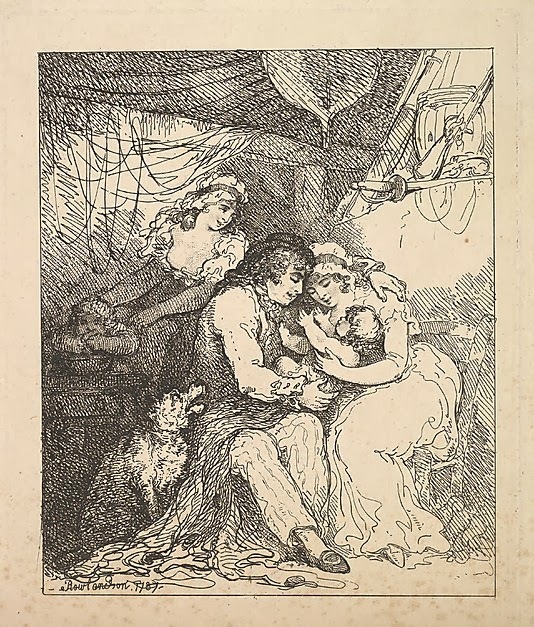 A Sailor's Family, Thomas Rowlandson, 1787, Metropolitan Museum of Art. Though often portrayed a rowdy, drunken womanizers, sailors are rarely shown in that domestic role that many of them played: father. Aboard a ship, a jack cradles his infant child in one hand, while embracing his wife with the other. Even a dog joins the happy family, looking up to the sailor for approval or acknowledgement. Though drawn in a year of relative peace for the Crown, the pistol, musket, sword, and powder keg above the family all hint at the ever present threat of war that intrudes on their private moment. The sailor wears a round hat with a low crown and very short brim. His hair is long and unruly. Though it is difficult to make out, the neckcloth appears to be plaid or striped. Our tar's jacket has unbuttoned slash cuffs. The trousers are very narrowly striped, his stockings are white, and his pointed toe shoes have oval buckles.